This is the Christmas card I made for my Husband. 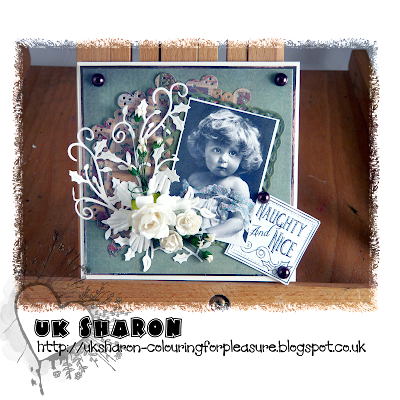 I adored this vintage photo and had been longing to use it for some time but with not being very well and not in the crafting mood I haven't got around to making the effort to use it. I used stickles to add a glitter embellishment to her dress and give it more of a Christmas' feel. I was quite pleased with the finished card which I don't say very often! This is so wonderful. I love how you put everything so beautiful together. This is an adorable card and beautifully executed. I love the white embellishments. Thank you for joining in at Card Makin Mamas. Love your card, love your use of 3D Embellishments and die cuts. Happy 2013! Wow love it.Great embellishments.Thanks for joining us over at Milkcoffee stamps Christmas challenge.